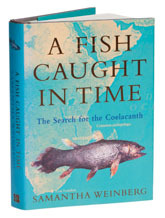 This is a book to go with Mark Kurlansky’s superb ‘Cod’, which we reviewed several issues ago – but while Cod is about a once common species which has been fished to the verge of extinction, Samantha Weinberg tells the story of fish which has come back from the dead. A Fish Caught in Time has had some rave reviews in its time and while it isn’t a bad book, it must be said that it is written in a deadpan Sunday columnist style which you will either love or hate. There is some good stuff in here; I had forgotten about the extraordinary political wrangling which surrounded the capture of the first coelacanth, spirited off French territory after the personal intervention of Daniel Malan, the South African Prime Minister, and the near break down in relations between the two countries which followed. The accounts of how all the early coelacanths died are ineffably sad, and one can only be glad that attention has focussed on how this magnificent fish lives, rather than on the specimen hunting fever that dominated the nineteen fifties and sixties.